The United Nations Environment Programme, UNESCO and Samsung Engineering are teaming up to start a visual conversation in Asia and the Pacific around sustainable development – to engage young people in sustainable actions that results in positive environmental benefits in their local communities through art. To begin with, a digital poster-making competition that captures environmental issues and/or encourages sustainable action in areas such as energy, waste and water, has been envisioned. The purpose of the contest is to engage youth to share their story of how, in their own capacity, to address environmental issues in their communities or countries. The theme of the Digital Poster-making competition is: Sustainable action in areas such as energy, waste and water. There are two sub-themes: 1) Inertia: A tendency to do nothing or to remain unchanged (the problem) and 2) UNertia: A tendency to act upon existing awareness (the solution). The two sub-themes may be combined. The competition invites captivating, inspiring and effective posters that speak to youth and the general public. 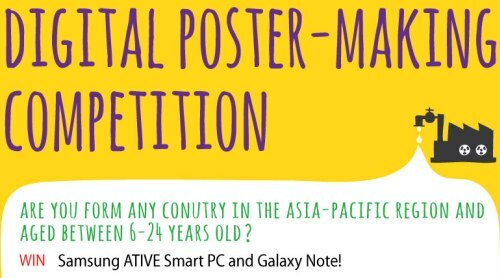 Eligibility: This competition is open to anyone aged 6-24 years old and resident in any Asia-Pacific country. Children aged under 13 should submit the posters via their parents’ accounts and please specify the name and age in the application form. Only ONE entry per participant is allowed. Poster Requirements: Posters created by students must be their own original artwork. Copyrighted characters (such as Mickey Mouse, etc) or copyrighted clip art will not be accepted. Dimensions: A2 size 420mm x 594mm in 300 dpi. Posters can be in the form of graphic designs, digital illustrations, or photographs. Feel free to use any available design applications/programs. All submitted art work will be displayed on the competition website and here http://tunza.eco-generation.org and will be credited accordingly. 3. No copyrighted artwork, characters, or brand names are used in the poster. Submission: The poster can be submitted to the Gallery of Tunza.eco-generationwith detailed explanation of the poster through the application form located along side. All participants must sign in to submit the poster. Deadline: All submissions must be received by 22 May 2013 with ‘My sustainable action’ in the subject.